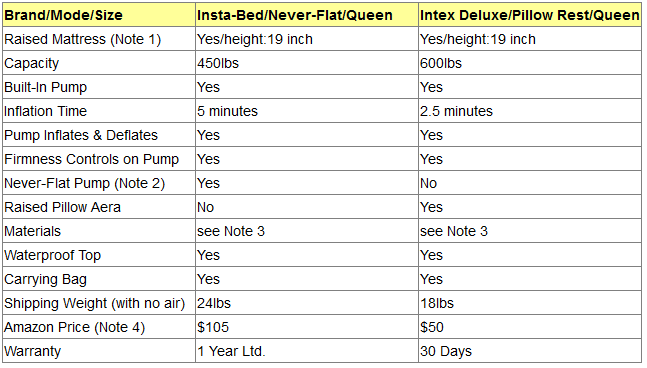 Compare Best Airbeds (Air-Mattresses): Insta-Bed or Intex? Airbeds are great for guests if your home is small and does not have extra bedrooms or beds, great for camping to sleep comfortably in tents, and great for traveling to create extra-sleeping space in hotel and motel rooms. Airbeds have evolved a lot in the last 10 years, and the best brands today combine quality, durability, style, comfort, convenience and easy-of-use at surprisingly low prices, and you will not be embarrassed asking your most discriminating guests to sleep on them. In this article, we will first explain what you should be looking for nowadays when you purchase an airbed, and we will then compare two of the best and most popular air-mattresses available. Note: In this article, we will use the term airbed and air-mattress interchangeably. 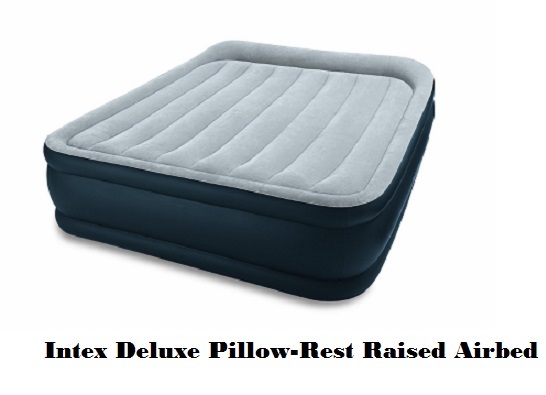 The air mattress manufacturers Intex and Insta-bed make some of the most comfortable and stylish air mattresses that combine quality, elegance, functionality and ease of use. Among Amazon customers, these mattresses have been extremely popular (top places on the air mattress best seller list!) and have mostly received excellent reviews. You will find below a description and comparison of two of their mattresses which are their best-sellers: The Insta-Bed Raised Never-Flat Airbed and the Intex Deluxe Pillow-Rest Raised Airbed. If you are in a hurry, and you would like to see right away price information on the selected Insta-Bed and Intex air-mattresses, please click below: Selected Insta-Bed and Intex Airbeds on Amazon. Otherwise, please continue reading below for information on must-have features on air-mattresses as well as a detailed comparison of the Insta-Bed Never-Flat and Intex Deluxe air-mattresses. Portability: One of the main advantages of an air-mattress is that it can be deflated and packed up for storage or for taking with you anywhere you may need an extra bed to sleep on. The best brands come with either with a carry bag or a rolling case that can be used for packing and moving around. You should not get an airbed that is too heavy when deflated, so it can easily be moved around. Built-In Pump: You don't want to have to carry an air pump when you travel and to have to spend time and effort to inflate the mattress each time you need to use it. The beat airbeds brands come nowadays with a buit-in air-pump. You simply plug and inflate your bed in seconds. Note that the pump should also be able to deflate the mattress quickly. Controls for Different Comfort Levels: This feature allows you to set the air pump inflate the mattress to your desired comfort level, be it plush, medium, or firm. Adequate Size and Raised Height: Nowadays you can get single, twin and queen size airbeds. So you should have no problems choosing the size that you need. But make sure that the mattress has enough raised height. Mattresses that are at least 15 inches high are easier to get in an out of bed than lower ones. Of course, higher than 15" is even better. 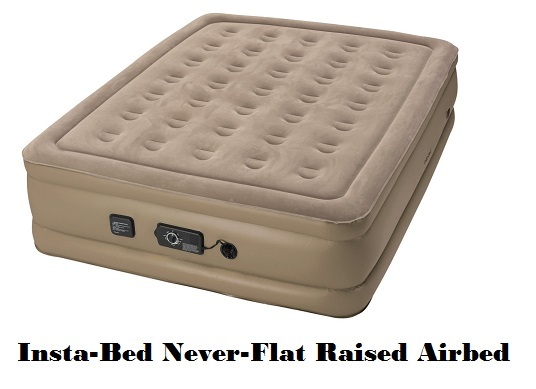 Never-Flat Pump: The pump built in some mattresses are able to maintain the air pressure throughout the night. They eliminate sagging and loss of air that is so common in airbeds by maintaining constant air pressure all through the night. Though this is not a must have feature, it is definitely a nice-to-have. Automatic Shut-off: This feature turns the pump off once the bed is fully inflated or deflated, allowing you to turn on the pump and walk away without any worries. Again, a nice to have feature. Built-In Pillow Rest: Some mattresses have a raised pillow area, a feature that you may or may not require depending on your sleeping comfort habits. Note 1: Height may vary up to 2 inches depending on firmness. Raised air bed design makes getting in and out of bed much easier. Note 2: Never-Flat Pump silently maintains your airbed's firmness level even if there is a small leak in the air mattress. Insta-Bed Materials: 31.2 gauge flocked top, 21.6 gauge vinyl sides and bottom. Intex Materials: 21.2 gauge flocked top, 15 gauge vinyl sides and bottom. Note 4: The prices shown are Amazon prices in effect at the time this article was written and may have changed. For exact price information, please click the product image links in the Amazon products section below. Note also that the Amazon price often includes a good discount on the list price. If a discount exists, both the list price and the Amazon price will be shown when you click the product image links in the Amazon section below. So which of the two air-mattresses is best for you? The first reason is that the Insta-Bed mattress has a 31.2 gauge flocked top and 21.6 gauge vinyl sides and bottom. 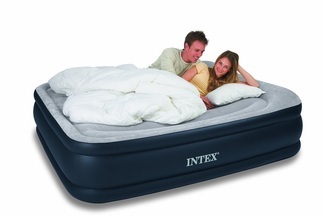 On the other hand, the Intex mattress has a 21.2 gauge flocked top and 15 gauge vinyl sides and bottom. This simply means that the Insta-Bed mattress is made of stronger and more durable material than the Intex. The second and more important reason is the advanced Never-Flat technology built into the Insta-Bed mattress. The vinyl that air-mattresses are made of has pores in it, so air leaks out over time, even if at a very low rate. Depending on the quality of the mattress, some some leak worse than others. Imagine, waking up in the middle of the night to inflate the bed because it has become uncomfortable due to air loss! Well, with the Insta-Bed mattress, you don't have to worry about any leaking. Once you set the mattress to the desired level of firmness, the pump makes sure that the set firmness level is kept all through the night. An exclusive and very useful feature not offered on the Intex. The third reason for the price difference is that Insta-Bed offers a 1 year warranty while the warranty on the Intex mattress is only for 30 days. We believe that the above three reasons justify the extra dollars you'd have to pay to get an Insta-Bed mattress, but if money is an issue for you, you will still be quite happy with the high quality of the Intex mattress which comes with the raised pillow rest, a feature not offered on the Insta-Bed mattress. Have you found yet what you were looking for?